A North Charleston disc golfer has been put on the injured reserve list for the next 4-6 weeks as he deals with a sprained drinking hand. Chaz Martin experienced the injury after taking a sip of his IPA can too quickly after hitting the basket from 30 feet out, and now doctors are unsure of when he’ll return before the end of April. Chaz’s injury occurred on the 15th hole of the Park Circle disc golf course when he was already four beers deep. 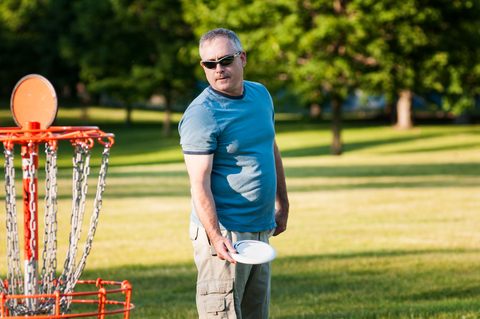 The wind was carrying his disc shots high and harshing his mellow, but everything gnarlied-out when he nailed the basket with his mid-range disc on his second shot. He pulled his IPA can to his mouth too quickly and instantly winced from the pain shooting down his wrist. He was forced to exit the course before finishing, which resulted in him losing his buzz. Chaz will begin the long road to recovery by getting stoned and playing Mario Kart and Rock Band 6 hours a day to restore his hand strength. In five years, he’ll become so good at disc golf that he’ll leave his pizza delivery job and go pro.